Leafs legend Johnny Bower passed away on Tuesday at the age of 93. Much has already been said and written about him, most of it conveying that as great a goalie as he was, Bower was an even better person. My personal experiences with him were few, but any time I had the opportunity to speak with him, it was always special. Bower’s exact age had long been something of a mystery. As a young boy, he lied about his age to join the Canadian Army in World Word II. (Many stories say he was only 15 at the time, others say 16). During his career, he enjoyed playing along with the guessing game, but in recent years it was determined that he was (probably!) born on November 8, 1924. His name at the time was John Kiszkan. A respiratory infection in 1942 likely saved Bower/Kiszkan’s life when he had to be hospitalized instead of being sent to France for the disastrous Dieppe Raid. After being discharged due to rheumatoid arthritis in his hands in 1943, Kiszkan returned to his home town of Prince Albert, Saskatchewan, where he quickly resumed his hockey career. He played for the Prince Albert M and C Warhawks and helped them win the Western Canada Intermediate hockey championship at the end of the winter in 1944.
over the Notre Dame Hounds to open the Intermediate Provincial championship. are from The Lethbridge Herald on March 18 and 20, 1944. In the fall of 1944, John Kiszkan had a professional tryout with the Cleveland Barons of the American Hockey League. 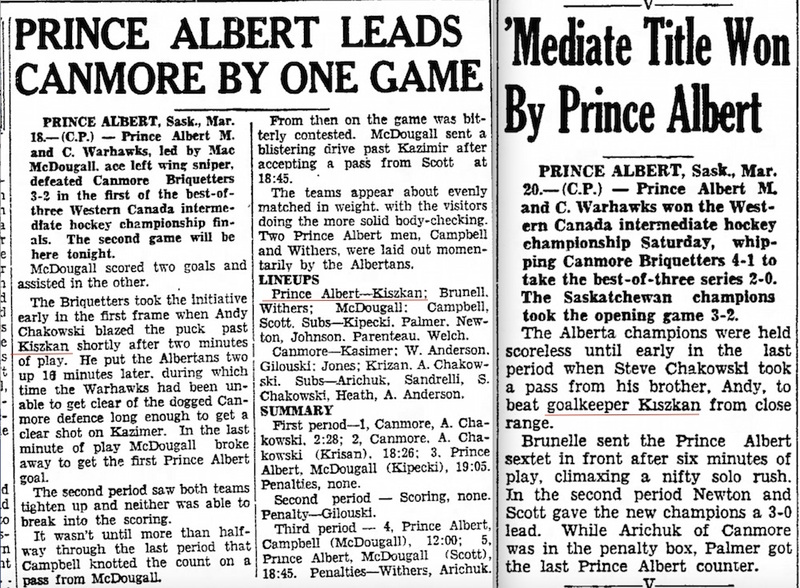 He didn’t catch on, returning once again to Prince Albert where he played Junior hockey. 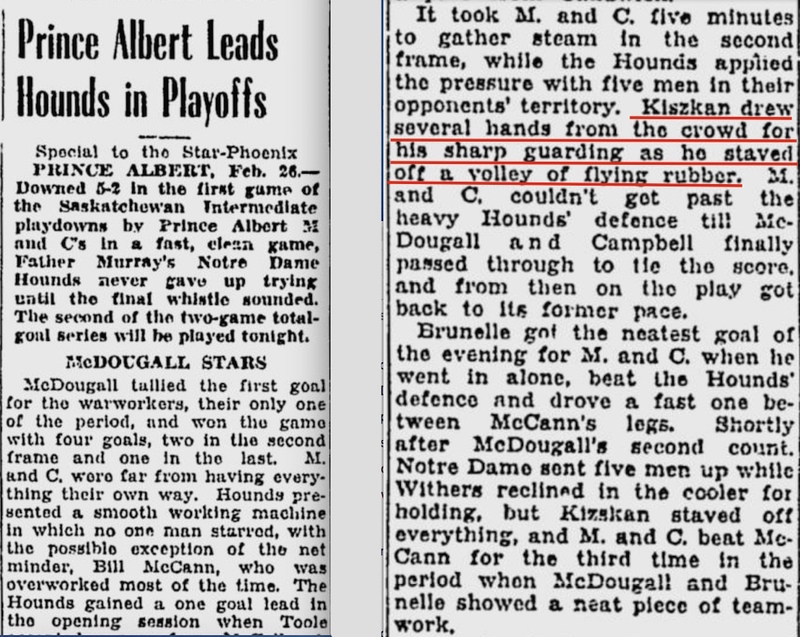 His Prince Albert Black Hawks won the North Saskatchewan championship in 1945 but lost the Provincial title to the Moose Jaw Canucks of the Southern Saskatchewan Junior Hockey League. Cleveland Barons story from the New Philadelphia (Ohio) Daily Times on September 29. 1944. 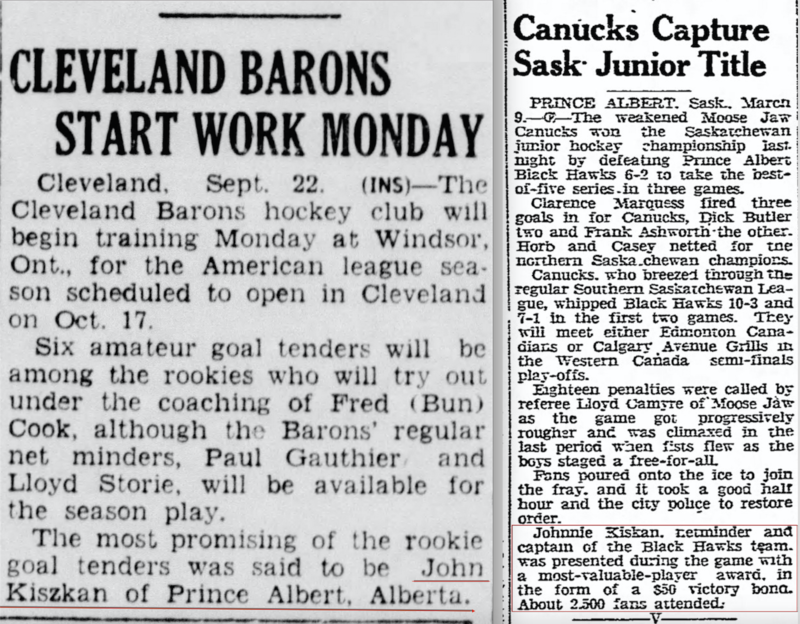 The Saskatchewan Junior story is from The Lethbridge Herald on March 9, 1945. The next season, 1945-46, Kiszkan began his lengthy minor league apprenticeship in Cleveland that would eventually lead to his great success in Toronto. From the Athens (Ohio) Messenger on December 28, 1945. A year later, John Kiszkan (whose last name had often been misspelled in newspapers, and must have been mispronounced by broadcasters as well) decided that his surname was just too difficult for the sports media. Bob Duff, co-author The China Wall: The Timeless Legend of Johnny Bower, told me that Johnny’s parents had separated by then, and when he turned 21, Johnny had his sister Rose, who worked in a legal office, help him change his name to Bower. It was their mother’s maiden name. this story appeared in the Winnipeg Tribune on September 24, 1946. His name appeared as John (Kiszkan) Bower in many newspapers throughout the 1946-47 season with Cleveland … but he would be Johnny Bower for ever after. Season’s greetings, Eric. Trust you to find a nice historical twist to complement Bower’s passing. Well done. I am not near my hockey books right now so cannot check my source but I recall Bower being quoted, I thought by Bob Duff, that he chnged his name because he was estranged from his father and did not want to bear his name. I’m only guessing but I imgine it influenced his decision to enlist at an early age. Can’t think of another player who returned from either World War to play any junior games, let alone a full season. Remarkable how young he was. Had a chance to meet and talk to Bower a few times at card shows. A truly genuine and wonderful man. As always Eric — a great piece. Great stuff Eric! You have, in one fell swoop, added YUUUUGGGLY to the ‘legend’ that is Johnny Bower, from my perspective and I’m sure from that of many others. 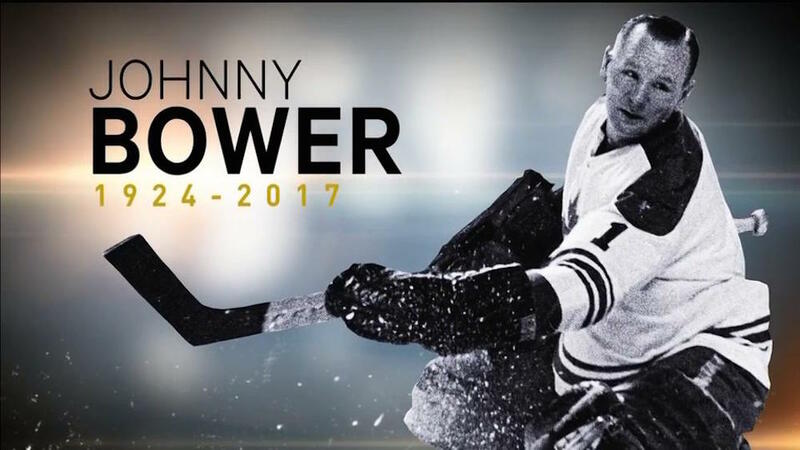 You well know my hockey background and I while I spent many hours with Johnny at a multitude of events, over the years, at the HHOF, most of the ‘detail’ in this article is news to me and it all simply amplifies how great and amazing a man the late, great, Johnny Bower (nee Kiszkan) was. I saw Bower play in the 50s and 60s in Boston, and there was something about the man who, despite getting bombarded with as many as 60 shots a game (Ouch! I’m blinking already! ), he still had a carriage of class and calm. At the same time he could be tough as nails and gave quarter to no one on the ice. Over his long career (more than 600 games in the NHL) he received every award in the book, but his greatest accomplishment was leaving Canada to join the Service in WW II. Nice work and I do believe the name change was because of a nasty family feud. 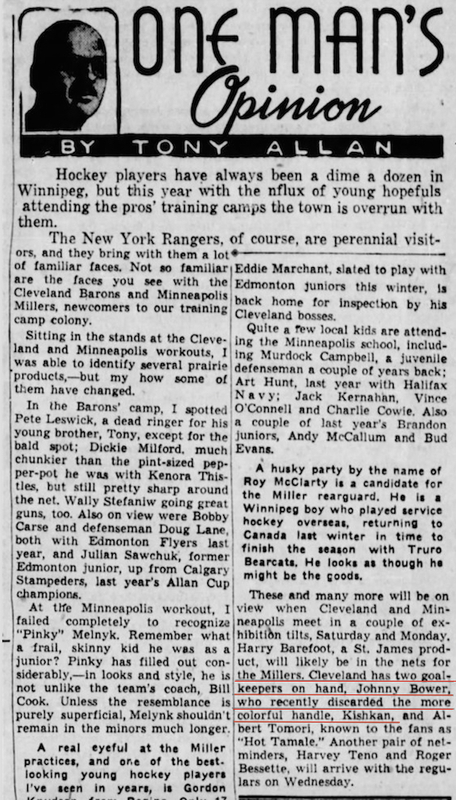 Little has been written that Johnny ousted Calder Trophy winner Gump Worsley for Rangers gig in 1953-54 — I saw all the MSG games — and then Gump beat out Bower the next year. Johnny was a solid 2.60 average with a non-playoff Rangers team. In Mike Leonetti’s HOCKEY’S GOLDEN ERA there is a great photo on the FORWARD page of Gordie Howe, Johnny Bower and Frank Selke Jr. When I think of Johnny, I think of that picture. Although I never met him, I’ve been told he was an exceptional person. I know he had a Christmas record out in the 60’s. I think it topped the Toronto record charts, even ahead of the Beatles. Bower was a gentleman and appreciated the good fortune to be in the NHL. Unlike some of today’s athletes, he was humble and friendly. That era of genuineness is over. AAHH so that is how he got the last name Bower! Not uncommon for people to take their Mother’s maiden name if it were spell-able & pronounce-able, lol…..
And to think even with Rheumatoid Arthritis he played hockey! That is VERY impressive!